Christmas morning I make an egg casserole. 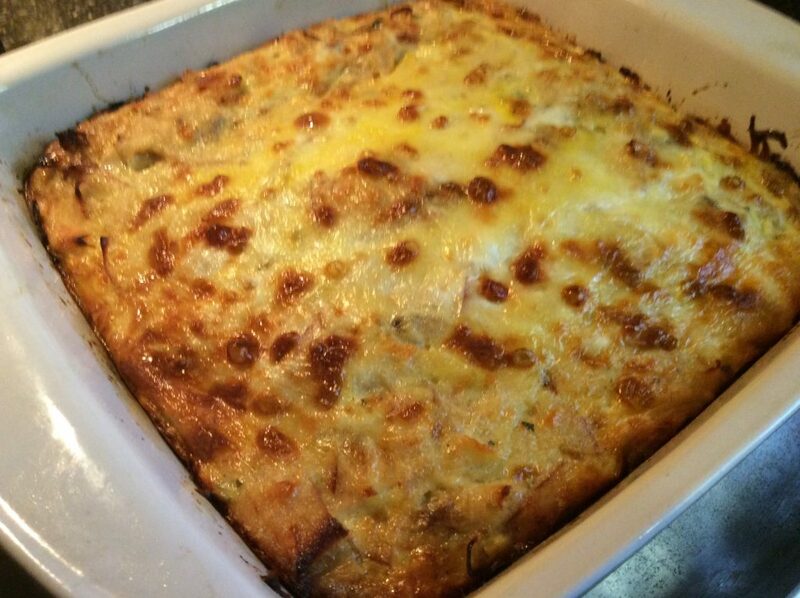 As I’ve become a parent and my life has become much busier, I’ve become a fan of a good breakfast casserole. I can make this the night before, have it in the refrigerator, then pop it in the oven when I awaken. I’m also a fan of cinnamon rolls because you can make those a day before and pop those in the next morning as well. I did not do that this year. I did make a smaller 9 x 9 size egg casserole this year because my family doesn’t eat it all when I make a large pan. One of the things I do that’s different is I don’t use breadcrumbs when I make my version. I like to use hash browns, tater tots or other potatoes on the bottom layer. It gives it a little more texture. If you cook those a little bit beforehand it really gives you a crunch. Besides, sometimes if you’re not careful when you use the breadcrumbs they can puff up like a soufflé. In my version I used tater tots, scrambled eggs, turkey, sautéed onions, and Italian cheese. I put some rosemary and garlic seasoning with a little bit of milk in that scrambled egg batter as well. One of the really neat things about this dish is that you can customize it to your taste. I mean you can use ham, sausage, turkey or you could go meatless. If you want you could just use sautéed onions, green and red peppers and mushrooms (kind of like a Denver omelet). 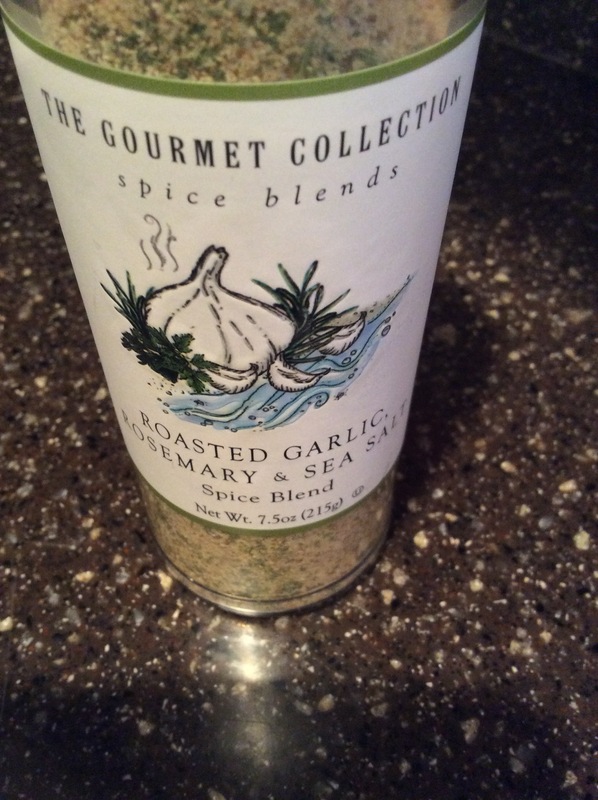 Just season this to your taste and you can use just about any cheese you like. Another great thing about this dish is you don’t really have to measure exactly; if you like more cheese, add more cheese; if you like less cheese, add less cheese; if you don’t want onions leave them out. And you can also freeze this if you have any leftovers. I’ve cut them into individual portions before, wrapped them in saran wrap and frozen them and then pulled one out when I wanted to eat it– or take it to work and eat it at my office. Anyway I’m going to share what I’ll loosely call my recipe with you below. 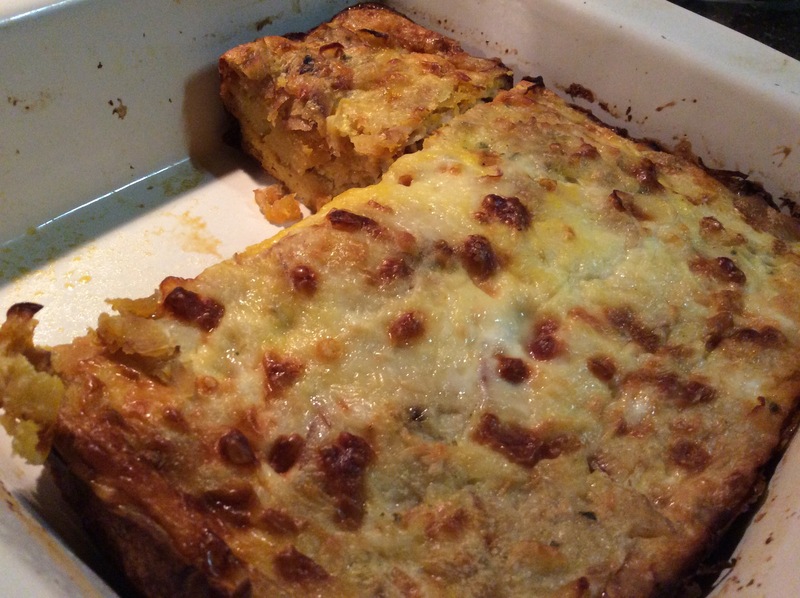 And if you feel like trying to make breakfast casserole I suggest you experiment with whatever ingredients you love! Slice ½ of a small onion and sauté until soft. In a greased 9×9 pan place a single layer of tator tots. 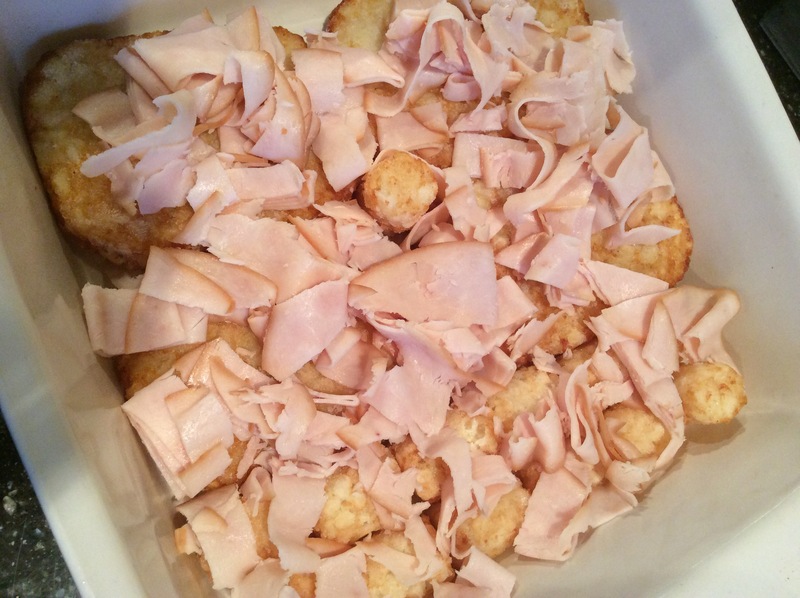 Slice the turkey meat into small pieces and spread over the top of the tator tots. Beat the 6 eggs in a bowl and add your seasonings and milk. By this time the onions should be cooked through so sprinkle those over the meat and potatoes. Then pour the egg mixture over the top. 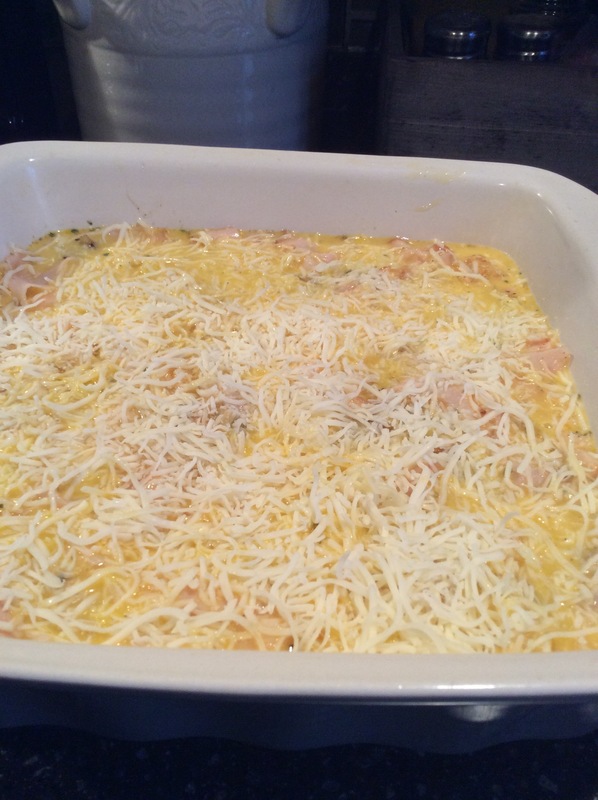 Place in the oven and bake until the egg mixture is cooked through, about 20 minutes. If the middle seems runny leave it in for 5 more minutes. 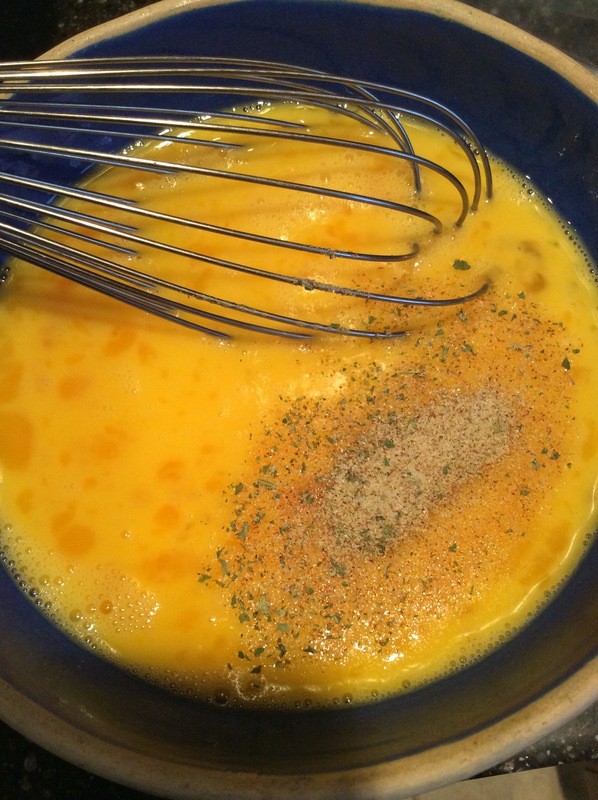 Eggs with the Rosemary Garlic seasoning. Sprinkle the meat over the tator tots. 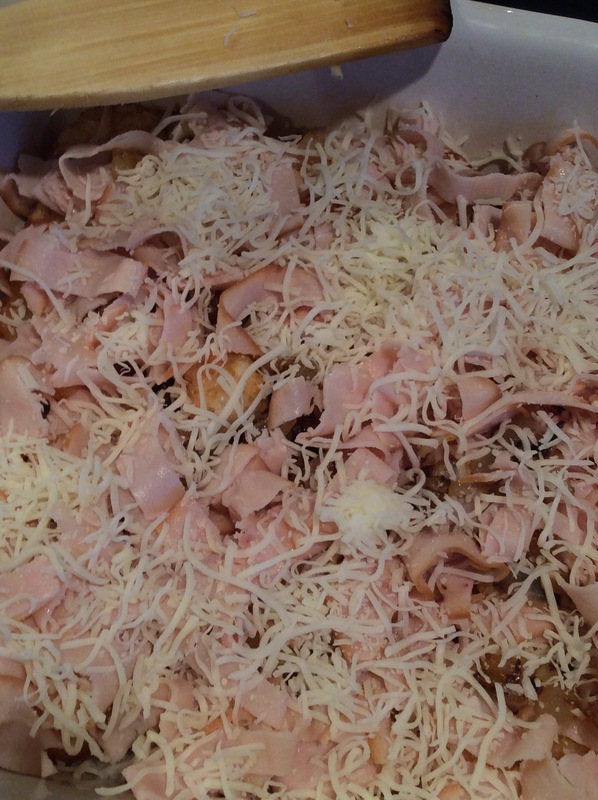 Sprinkle the cheese over the top of the meat and potatoes. Nicely done Belinda! Love mixing up all the different foods. A fav dish. thanks! I always cook randomly. I like to change things up whenever I get a chance.